What to look for when buying a stationary bike? For some people, just the thought of going to a crowded gym to exercise is enough to put them off. They do not want to be in a busy, public space as they sweat themselves thinner. If this is ringing bells with you, there are ways of exercising within the comfort of your own home to avoid becoming anxious about exercising in public while still being able to reap the benefits. A fabulous and proven very beneficial way to lose weight, increase fitness and improve muscle tone is through the use of a stationary bike. In the long run, this will be a much more cost-effective exercise technique. They are not anywhere near as bulky or difficult to store as a cross trainer or treadmill so will not get in your way, and you will be able to save valuable time without having to make frequent journeys to and from the gym. Related Review: Recumbent Exercise Bikes. Looking for a fantastic piece of equipment that allows you to do high-intensity cardio while remaining in one position? Look no further! The Marcy Club Revolution Bike Trainer is a very durable bike created from steel to enhance its sturdy feel and safety of the rider. It is both rust and corrosion resistant and has been sealed with a powder-coat finish. With its ergonomic seat designed for your comfort and mounting ease, adjustable handlebars and saddle, this really is a very user-friendly stationary bike. It has been created in the same style as a road bike, so great for people who are training for road races. It can support cyclists of up to 300 pounds with no issue and has a quick-stop mechanism should it be required. Challenge yourself by increasing the resistance and intensity as you increase in fitness with this striking, yet effective cycle trainer. Why We Like It – We like the Marcy Club Revolution Bike Cycle Trainer because it allows a very stable feeling, high-intensity cardio workout to be undertaken in a very comfortable but effective way. Limited for space and storage? This bike has been created with a focus on space saving as it can be easily folded and stored, taking up just half of its original size. 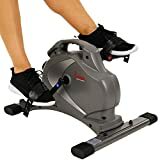 This is a great option for anyone requiring a more compact exercise bike which can easily be moved around to change location through its use of transportation wheels. With a weight capacity of 300 pounds, this folding bike caters for almost all riders. It is easy to mount/dismount and is comfortable even when a longer workout is endured. Use the easy to read, LDC display to monitor the most important factors while you ride, like distance, time, speed, pulse, scan, heart rate, and burned calories. Suitable for users between the heights of 5’3″ and 6’1″ and with a seat large enough to suit any posterior. It has a 3 piece high torque cranking system to ensure smooth and consistent rides, 8 different magnetic levels of tension for more intense workouts. Why We Like It – We like the Exerpeutic Folding Exercise Bike because it enables users with limited floor and storage space to still be able to participate in their home exercise regime in an effective way. 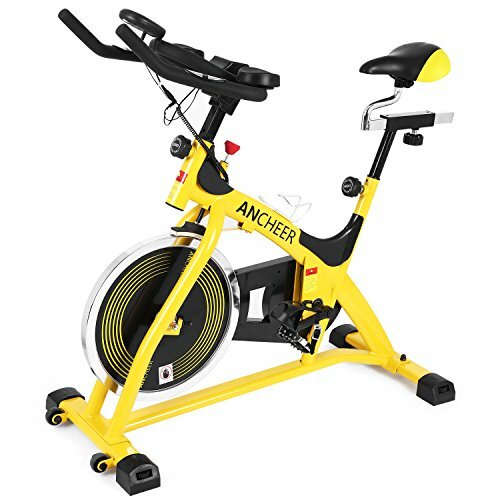 Stand out on this Ancheer belt driven stationary bike. It has a 40-pound flywheel, has a durable steel frame and offers its rider a safe, smooth and silent method of exercise. Created through the use of heart rate sensor design technology, this bike will help you to keep an eye on all of your vitals, like pulse and heart rate. Through the use of its elbow trays, you can ride with a great deal of comfort, added to by the adjustable handlebars and saddle so that you can find the best cycling position for you. If you are looking to consistently increase the resistance during your training, then this could be a great indoor bike trainer because it has such a high-end resistance system offering almost unlimited resistance capabilities suitable for riders looking for high-intensity cardio workouts. With transportation wheels and an adjustable base, this stationary bike is suitable for any rider, any home, and any floor type. 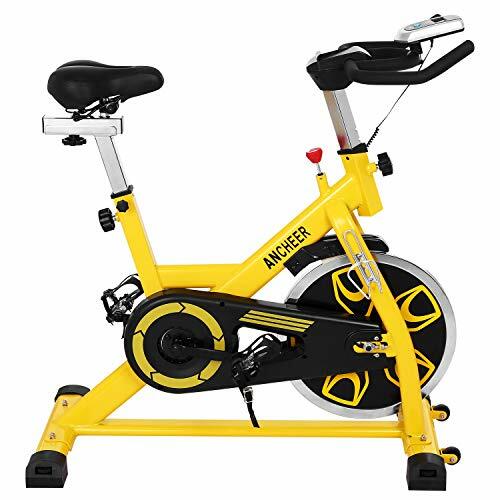 Why We Like It – We like the ANCHEER Stationary Bike A5001 because it has been innovated through the use of very advanced technology to ensure the best cycling experience possible from a stationary bike. 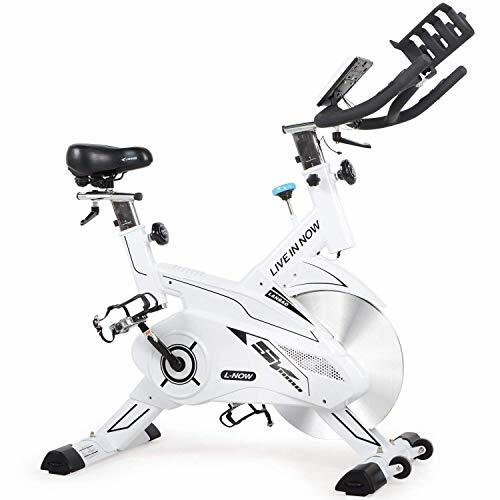 If you intend to spend long periods of time on your stationary bike, then the Now Indoor Cycling Bike Trainer has been designed for the specific purpose of comfortable endurance training. Adjust the seat, handlebars, tension, resistance and display screen to suit you. Use the microfiber handlebars to extend your grip time and the water bottle stand to remain hydrated. Driven by an automotive-grade, patented belt-drive system, it is smooth, quiet and incredibly low maintenance. With a 35 pound flywheel, you can switch between different types of exercise with no hesitation or inconvenience. Its in-built performance tracker helps you monitor progression in relation to times, speed, heart rate, pulse rate, and calories burned. There’s a stand for your tablet so that you can keep motivated, engaged and encouraged throughout your exercise regime, or even multitask by replying to all of those mounting emails while you’re on the move. Supportive of users up to 300-pound weights, this is a stationary bike to help anyone achieve their potential. Why We Like It – We like the NOW Indoor Cycling Bike Trainer because of its automotive-grade, patented belt-driven system which is perfectly suited for endurance training, with no maintenance required and a comfortable ride. Suitable for riders of any ability, up to 280 pounds, this bike has an AV frame thickened to 50mm and a 35-pound flywheel. Adjust the handlebars and seat to suit you, altering the resistance in relation to your skill level, workout intensity, and training requirements. The clearly displayed digital monitor keeps track of your times, speed, RPM, burned calories and cycling distances. Sync up to the tablet to participate in online cycling classes and use the transportation wheels to change your standalone bike’s location. The pedals are caged 9/16 inches ideal for speed, safety, and comfort. If these are not to your liking, you can easily change the pedals to a more preferred pedal, their only requirement being that they are of a 9/16 inch crank so that they are held firmly and safely in place. Request a wider seat if you think that this would add to the comfort of your ride, encourage you to ride more frequently or cycle for longer periods of time. 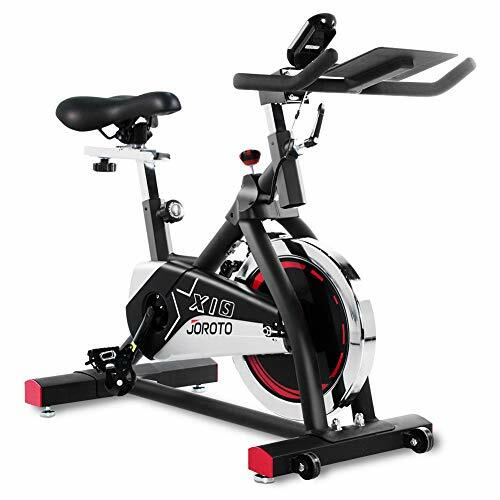 Why We Like It – We like the JOROTO Indoor Cycling Bike Trainer because it is so substantial, safe and strong in its creation, so not only will you be comfortable, you will also feel very secure. As belt driven, stationary exercise bikes go, there aren’t many as powerful as this one with its 49-pound inertia-enhanced flywheel, given a more pronounced replication of a natural bike ride outdoors. The belt drive enables you to partake in a much quieter, smoother and consistent ride, working your body effectively from your first workout. It has multiple additional features such as its adjustable resistance, quick stop braking mechanism, tension knob, moveable non-slip handlebars, pro grip pedals, toe cages, and foot straps. All of these elements designed for rider safety, efficiency enhancement and to aid the rider to gain the most from the workout working as many body areas as possible. Use the ergonomically designed, padded, adjustable seat to keep you stable and comfortable while you train, even when training becomes more endurance based. Why We Like It – We like the ANCHEER Indoor Cycling Bike because it’s so easy to adapt to your needs that it works well within a home with multiple indoor cyclists without causing frustration to altered settings. Catering for weights up to 275 pounds, the Sunny Health & Fitness bike is solid, trustworthy and reliable. Its frame reflects its sturdiness having been created from steel though it remains light enough to move around the house to your desired location with the use of its transportation wheels located at the front. Increase your resistance to make you feel as if you are actually out on the road giving you a more intense workout, toning many different muscle areas and burning higher calorific rates. This bike is quiet, smooth and maintenance free, so you never have to worry about getting distracted or have the frustration of not being able to cycle when you need to. Change the seat height and distance from the handlebars, alter the handlebars themselves and use the toe caged pedals provided to give you the ultimate safe and comfortable ride. 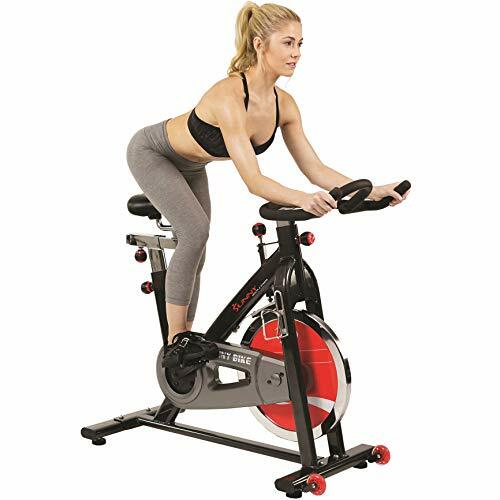 Why We Like It – We like the Sunny Health & Fitness SF-B1002 Indoor Cycle Bike because it is as reliable in its workout regime as it looks aesthetically. It’s solid, reliable and maintenance free! 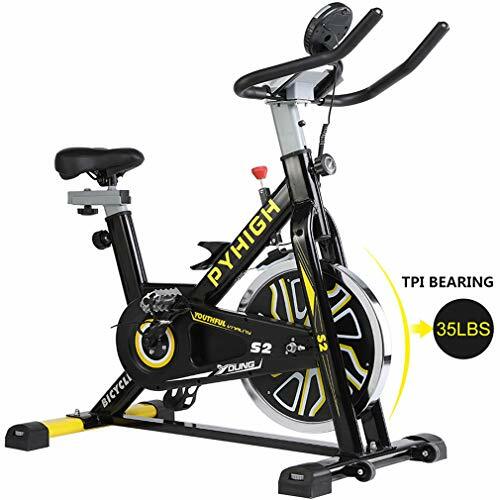 If you are in search of a more intense workout through the use of a stationary bike, then the Pyhigh bike could be just the answer you’ve been looking for thanks to its bi-directional flywheel weighing in at a hefty 35 pounds to increase the intensity of your workout. Use the LCD display to track your vitals and track your exercise regime in a more scientific manner. Use the phone cradle to watch videos or listen to music as your workout. Alter the saddle and handlebars to your liking and use the emergency quick stop mechanism should you require it. You can amend the training level and the resistance to suit you and training you wish to do that day. 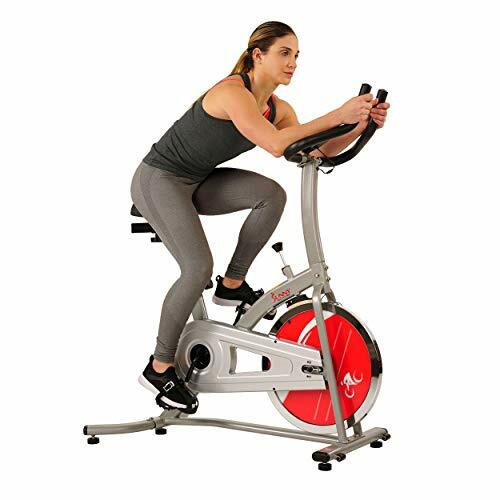 A great stationary bike for cyclists up to 280 pounds, cleverly designed with anti-slip pedals, toe cages and straps to ensure that you are safe however you are riding. Why We Like It – We like the PYHIGH Indoor Cycling Bike because of the amount of attention that the safety has been given during the creation of this bike with its anti-slip pedals, toe cages, and straps. For a general cardio workout, think about purchasing the Marcy Club Revolution stationary bike, helping you to achieve the benefits of a full cardio workout without leaving the comfort of your own home. It has a sturdy steel frame which is rust and corrosion resistant, and it has been powder-coated to provide the highest level of finish. Designed for your comfort, the ergonomic seat replicates the style of a road bike, which, along with the adjustable rubber handlebars, are both adjustable to maximize your comfort and posture. This will enable you to remain training for longer periods of time, increasing your fitness, muscle mass, and weight loss. This bike is more than capable of supporting users up to 300 pounds, has an instant stop mechanism and gives you as much of an intense workout as you like. Why We Like It – We like the Marcy Club Revolution Bike Cycle Trainer because it is so heavy duty. There doesn’t seem to be anything that this bike cannot handle, and it will always work hard for you. For cyclists of lower weights, the SF-B1203 is a viable option, supporting weights of 220 pounds maximum in a very stable manner. It keeps comfort in mind with its ergonomically designed seat which can be adjusted horizontally and vertically. Increase the level of resistance use the in-built brake technology in case of an emergency, helping the flywheel to come to a complete halt immediately. Keep a record of your fitness performance and progress with the LCD monitor, showing the times, distances, speeds, and calories you have burned. With a high inertia flywheel, you have a great deal of control over the level of resistance you are riding with as the flywheel is 22 pounds in weight. This bike offers you a chain drive mechanism, paddle style rubber foam handlebars enabling you to cycle for longer, and pedal cages for your cycling safety preventing you from slipping, causing injury or damaging the stationary bike. Why We Like It – We like the Sunny Health and Fitness SF-B1203 Indoor Cycling Bike because safety and comfort have been centered on in equal measure ensuring that you keep coming back to it for more. 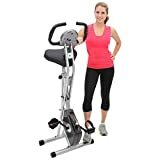 Before you make a decision as to which stationary bike you are going to purchase, it is good for you to have clarity as to what the main purpose is for your use of an exercise bike. Are you wanting to lose weight, test your endurance, increase your muscle, or keep fit? When you know the most prominent answer to this question, even if there are multiple outcomes that you may be trying to achieve, it will help you to make a more educated decision. For example, if you are wanting to increase your muscle, building up your glutes and calves, you may want to look at a bike with heavier weighed flywheels so that the resistance levels can be heightened to really push you and your body to your physical cycling limits. For many people looking into buying a stationary bike, it is important for them to consider how much space it takes up within their home. If you are living in a smaller space, like an apartment block, for example, it could be helpful for you to think about buying a folding exercise bike so that it can be stored easily and will not take up a large area of floor space when it is not in use. For city center dwellers, floor space is at a premium, so this is important to think about. Take note of the maximum weight that a stationary bike can cope with. If you are wanting to use an exercise bike to lose weight, no matter how much weight, this is an important factor to keep at the forefront of your mind. This is not to embarrass anyone, it is purely done to keep you safe. If weight limits are exceeded, your safety is at risk, accidents are likely to occur, and permanent damage could be caused to your stationary bike, which may be costly to repair if they are at all fixable. The prospect of cycling is off-putting for many people due to past negative experiences of their saddle. But it doesn’t need to be! 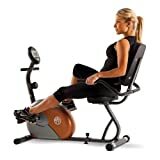 There are actually stationary bikes that come with the added option of you being able to request particular seats, ergonomically designed for extra comfort, extra padding to prevent friction and symptoms of saddle sore from occurring, and others are larger than average if you want more support, want to feel safer or want more stability. There are stationary exercise bikes with seats to suit every size of the user and every body shape. For exercise bikes of any variety to remain safe, they must be used on a flat surface, but of course, this isn’t always possible. Often, for people who live in older properties where floors are commonly not level, this has limited their ability to use stationary bikes, but this is no longer the case. Now, the majority of stationary exercise bikes are fitted with levelers which enable the bike to have direct contact with the floor and be well leveled. This then means that the bike is stronger, you are safer, and no accidental damage will be caused to you, the bike or your flooring. Why is the stationary bike so well liked? Stationary bikes are well-liked for multiple reasons. Firstly, they enable a person to exercise from within the comfort of their own home, often saving them money on gym membership and preventing them from wasting precious time traveling to and from the gym. Secondly, they are a very low impact method of cardiovascular exercise giving your body an overall workout, aiding with weight loss, muscle tone, and general fitness. Thirdly, for people with joint problems who struggle to find methods of exercise suitable for them, cycling solves these issues because it does not affect the most frequently problematic areas such as the knees and the spine. Lastly, often we spend inordinate amounts of our days sitting, whether it be in cars, at desks or in classrooms. When this happens, the muscles become shorter because they have not been extended for anything other than sitting. Strength and conditioning help with the problem of people struggling with being stiff and achy, which a stationary exercise bike can help you to achieve. Do I have to buy cleated shoes to use a stationary bike? You must only have cleated shoes if you have a bike with cleated pedals. Cleated pedals combined with cleated shoes enable a fuller and more consistent pedal stroke as well as enabling you to gain a large power build up in your glutes and hamstrings. If your bike does not have cleated pedals, then you do not need to wear cleated shoes. Take this into consideration before you purchase a bike as cleated shoes can be another expensive addition, especially if there are multiple members of your household who are wanting to use the stationary bike. If you are concerned about retaining your focus, concentration, and motivation for continued training, then there are many different ways in which you can help yourself. Perhaps looking for a stationary bike with a tablet or phone holder could be of use to you. This way you are able to listen to empowering music, sync with online gym or spinning classes, communicate with personal trainers or other people who are also training from the comfort of their own home.